I had a Target bag full of purchased stockings sitting on my counter when I decided to make my own. So…the Target stockings were returned (after I traced one for a pattern!) and I made my own. I’ll share a tutorial for how I did the cuff part in the next couple of days….only because I know by the time I have another baby to make a stocking for, I’m not going to remember how in the heck I made these ones. I like that they are matchy without being matchy-matchy (that makes sense when I say it out loud). So when more kiddos come along I won’t have to worry about getting the exact same stockings, and I’ll be able to whip one up with the same color palette instead. I love them! Such a nice, fresh take on the traditional Christmas palette. Not sure I can find the courage to whip up six of these though… oh. so. tempting. ohhh, I like!!! I have to make 3 stockings as gifts, I better get cracking. 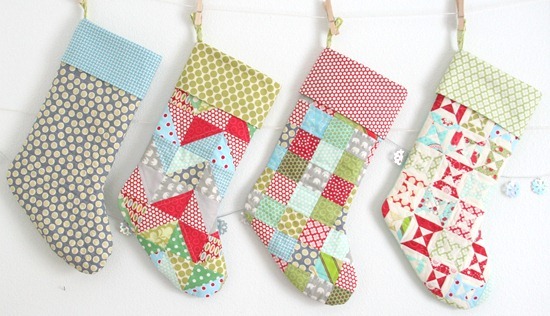 I really love that patchwork stocking! Looks great! I still have to make our son's stocking for this year. But seeing as how he's only 8 months old, I'm not too worried about it. we ran in to the problem of having 3 matching stockings that I made, but then we had another kid. 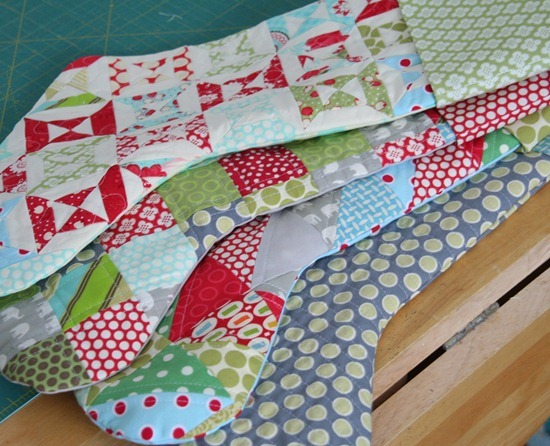 So, three stockings are huge, and the 4th is tiny and made from scraps from the first 3. Would have been better to go your route, and just have fun colors be the theme! How many kiddos are you planning??? simply gorgeous! Love them all! Very pretty and WOW that was quick!! This is exactly what i have been looking for! I'm looking forward to your tutorial. Great fabric choices! I love how the stockings all turned out. I made our kids stockings using leftover fabric from their baby quilts, and just 2 years ago finally made my hubby and I new ones. I just love them! They are all different fabrics, but they reflect our individuality. 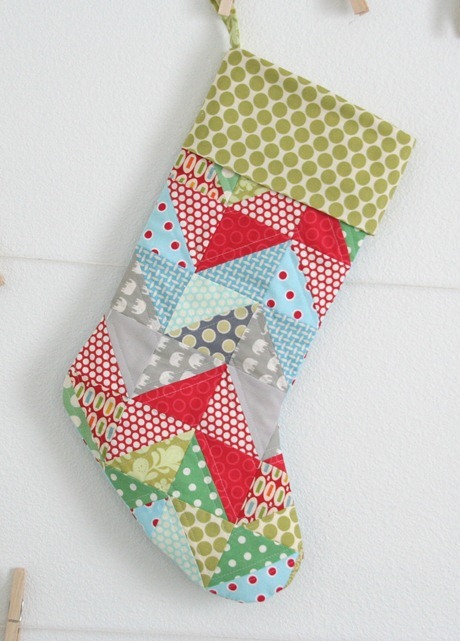 Your stockings came out super cute – really love the blocks patterns you used! LOVE these ~ so beautiful and so special because they are handmade. Great colors! Adorable!! Such sweet stockings :) What's the yellow and grey dot? I am looking for one like that and can't find one anywhere! So funny, I just did the exact same thing! Of course yours are much nicer. I just learned how to sew though! They're so adorable! Thanks for the link to Simplify, that's such a great blog too! You have been working fast! I got Camille's pattern and am finishing up the hexagon one today…hopefully I can make a few others next week! I love that you took your stockings back AFTER tracing the pattern… I thought I was the only one who did that kind of stuff!! I love them!!! I can't wait for the tutorial. I'm with ya on the level of matchy matchy! Ok…so you motivated me to finish mine…hope it's okay I linked to this post in my post today…really love these! Hey you! So you found something to do with those little triangles!! I love the stockings! I might just have to make some for my mom to leopard at her house for guests because we don't have any here. The cuff is the worst part for me so any advice on that would be really helpful! Hope you're staying warm!!! Leopord? Meant "keep". Stupid auto speller on my phone!! I love these!! 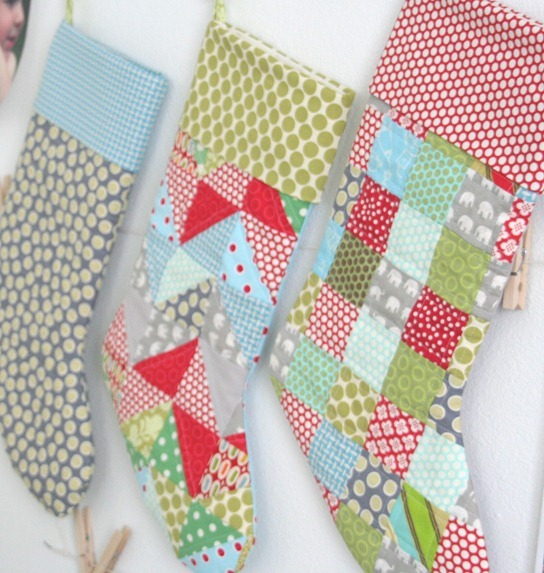 I need to make my family stockings! I need to dive into the fabric stashes and see what there is!! These are beyond fabulous. Completely in love with them. You make the most fabulous things ever. Seriously. If you don't mind, just whip up 4 more for us as well! If I've said it once I've said a 1000 times – I love the fabric combinations you pick out. I don't think I could pick out so many as well as you and have them all look good together. Sigh. how adorable!!! gives me some inspiration! thanks for sharing! These are beautiful! I'm sooo jealous! Thank you for this Tutorial. I completely understand your dilemma with linings etc as I have exactly the same problem (including Foundation piecing!) I got myself in a complete whirl recently trying to figure out how to line a simple Tote Bag. I think it's a lack of Spacial Awareness, obviously a missing gene and I also have difficulties with Left & Right! Thanks for the tutorial, I love it! I love the variety you made, they look great. Your finished stockings are just fabulous!! Thanks for the tutorial on the lining! That's really clever!!! Good for you! These are so pretty.